More than a rebranding of the Scion FR-S, the new Toyota 86 is enhanced with new performance, handling and style. The Toyota 86 is built around a 2.0L four-cylinder horizontally opposed flat 4 Boxer engine. Improvements to the engine for 2017 include stronger a piston head surface and reduced friction for improved fuel efficiency. In addition, the intake system and exhaust manifold have been optimized. Two transmissions are offered: a six-speed automatic with dynamic rev management, or a six-speed manual. 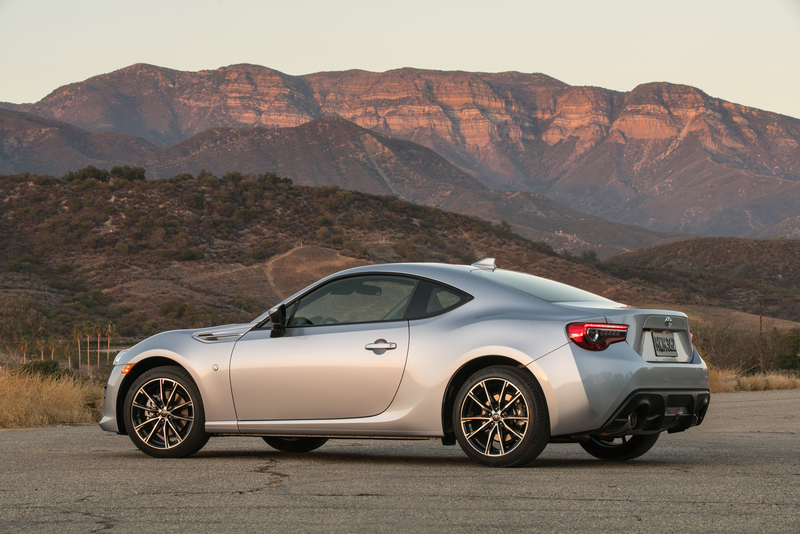 Toyota 86 models with the automatic generate 200 peak horsepower and 151 lb-ft of torque. Those equipped with the six-speed manual gearbox enjoy a rear differential ratio change – from 4.1 to 4.3 – a torque increase to 156 lb-ft, and a five-horsepower boost to 205 peak horsepower. All models deliver increased handling stability through a combination of improved aerodynamics, revised shock tuning and a spring rate change. In addition, the Vehicle Stability Control system has been re-calibrated and includes a “Track Mode” to enhance sporty driving, and all models are now equipped with Hill-start Assist Control to help prevent rollback on inclines. To match this new performance, the Toyota 86 also receives more aggressive styling, with a larger centre intake that emphasizes the low, wide stance of the car. A new front design features reconfigured LED headlamps and turn signals. The rear now sports LED tail lamps. And revised bumper designs grace both ends. The alloy wheels now feature ultra-thin spokes to provide design contrast and evoke an agile, sensual and emotional impression and 86 logos have been incorporated into a front fender badge and inside the front headlamps. Inside, new seating material with silver stitching welcomes Canadians to the driver-focused cabin. The instrument panel surround and door trim employ new, soft-touch materials. The 86 logo graces the panel and a newly-designed steering wheel with enhanced grip design and integrated controls for the audio system. The 4.2” multi-information display provides a range of data unique to sports cars, including a G meter, a torque curve, a stopwatch and a lap timer. The three-ring design of the meters has been accentuated for a higher-quality finish. All models are generously equipped with an extensive list of standard equipment, including: eight-speaker, 6,1” Display Audio System with Bluetooth capability, air conditioning, passenger side rear walk-in assist, aluminum sport pedals with rubber inserts, leather wrapped steering wheel and shift knob, cruise control, power adjustable and heated exterior mirrors, and more. Safety is always standard on a Toyota, so every 2017 Toyota 86 is equipped with active and passive safety features, including six airbags, the Toyota Star Safety System, a backup camera, high-mounted LED stop lamp, and more.